AAPR: Could you tell me about your background? CHIN: I like to say I’m Detroit-born, New York–raised, and Los Angeles–based. I’m the middle child of a large Chinese American family that somehow ended up in the Midwest in the late 1800s. I’m currently working on a memoir of my childhood growing up in the family business that my great grandfather started in 1939. It’s called Everything I Learned, I Learned in a Chinese Restaurant. I’m also currently filming a new documentary in New York City called Tested. It’s about the fight that families have to go through to get their kids into one of the elite public schools in the city, like Stuyvesant or Bronx Science. Prior to that, I’ve written poetry, plays, and for mainstream television. AAPR: What was it like growing up as an Asian American in the Midwest? CHIN: Oftentimes, I think of myself more as a Detroiter rather than an Asian American because I think that experience of growing up in a Motor City really binds you. Whenever you’re the underdog, it forces you to pull together and fight for your identity. One of the defining moments of growing up there was the Vincent Chin murder, which happened when I was a kid. Prior to that, Detroit had always been a black and white city. As Asian Americans, we seemed to be respected by both sides. When Vincent, who was a family friend, was brutally murdered like that, I think that really forced me to question my position, not just as an Asian American, but also as a Detroiter. That’s really shaped my identity since then. AAPR: What has been your inspiration for your work? CHIN: My parents have always instilled a sense of fairness and social justice in our family. My five siblings and I are all involved in some type of charity or activism. In some ways, I think it was inevitable. Not only did I grow up with a strong sense of racial justice because of the Vincent Chin case, but when I moved to New York City at the age of twenty-one, I was able to see the devastation AIDS had brought to the LGBT [lesbian, gay, bisexual, trans*] community. In both situations, lives depended on everyone getting a fair shake. AAPR: There are many ways to tell stories, make an impact, and advance social justice. Why film? CHIN: In terms of making Vincent Who?, I was already working as a writer. Writing was something I studied in college and pursued immediately afterwards. Making the transition from television writing to filmmaking wasn’t that hard because you pick up a lot of the necessary skills. Also, as a community activist, I had a lot of experience producing cultural events. So it was a marriage of both of those skill sets. I think the reason why film is so powerful is because it’s the medium in which young people talk. So many younger people learn things through video. So it seemed like an easier way to tell that story. AAPR: What were you trying to achieve with the production of Vincent Who? CHIN: Vincent Who? started off as a personal project. My father had just died in a car crash in Detroit. I had to go back home to sell the family business and sell the family home. When I was back there, I was just looking for a personal project to work on. That’s when I remembered the Vincent Chin case as a story that had really inspired me growing up. So I decided to take a year off to write and produce this film. I didn’t even tell my agent about it because he would have said, “Go get a studio job.” But it was a story I was committed to telling—I felt like it was a project that not only connected me closer to my family, but also to my community and my hometown. So that’s why I decided to make the film. In terms of the response that it’s gotten, it’s been overwhelming to think that such a small film could have such an impact. It’s been really heartwarming. Hopefully, it’s helped keep Vincent’s name alive, but more importantly, provides a focal point for the Asian American community to move forward. AAPR: Is there anything else you would like to add about your work with Vincent Who? CHIN: With Vincent Who?, we really wanted to take an honest assessment of the Asian American community. We didn’t want to make film that was just cheerleading, rah-rah, everything’s great. There’s a lot of work to be done for the community to achieve its full equal rights. In order for that to happen, we need to take an honest assessment of our victories but also our failures. AAPR: In making Vincent Who?, were you hoping to advance a larger issue? CHIN: I had no idea how popular the film would be, how many people would watch it, or who would be interested in it. So, I don’t know. I felt compelled to make the film because I needed to connect to this story, to explore an idea that was personally interesting to me. As for its anticipated reception, I didn’t have specific goals, such as I want this many people to watch it, or these many people to teach it in their classes, or this many people to write me. I don’t know if I had any specifics, but I felt like this was a story that touched me and I would hope that it would touch other people, too. AAPR: What inspired you to produce the documentary Tested? CHIN: After making Vincent Who? and being out of television writing for a few years, I realized I was now a documentary filmmaker. In order to be called a documentary filmmaker, I figured I needed to make a second film. So I was looking for a project, and a lot of people were coming up to me and asking me to produce a film on their story. While there were some interesting stories out there, none of them really spoke to me. In order to make a really good film, you have to be passionate about the subject because you’re going to be sacrificing a lot of your time, your resources, and expending a lot of emotions on the project. So you really have to feel this is a story that you need to tell, and one that you can bring something to the table. I didn’t run across any subjects like that until I read this article in the New York Times about a Chinese American student in New York City who was preparing to take an exam to get into one of the specialized high schools in the city. After reading that article and the issues surrounding that debate, such as access, public education, and social justice, I felt like that would be a perfect follow-up to Vincent Who? because it addressed a lot of the themes that I was exploring in the first film. AAPR: What are you trying to achieve with Tested? CHIN: With this second film, I have a better sense of the potential of a documentary in terms of impacting debate. In America, oftentimes, the debate is framed in the context of black and white, rich and poor. Anytime you include the Asian American perspective, it oftentimes muddies the water—it challenges prevailing paradigms. My goal with this film is to insert the Asian American perspective when it comes to education policy in America. Education has been one of the primary tools in which the Asian American community has been able to advance itself despite facing discrimination in this country. Because of that, I think it’s vitally important that our voices are heard whenever any type of debate comes up regarding education policy. AAPR: How do we begin to shift the mainstream dialogue from “too many Asians” to talk about actual issues of access and educational disparities? CHIN: It’s very easy to stereotype people in a community when you don’t get to know them on an individual level. One of the powers of filmmakers is that we can tell individual stories. We can humanize the community. We can put a face to our struggles. That’s what I hope to do with this next film. We’re featuring several different types of families, not just Asian American—Jewish, Italian, Puerto Rican, Dominican, African American, as well as Chinese American, Bangladeshi Americans—to show that the experiences are similar, but also, at times, different. That’s probably the greatest thing that filmmakers can contribute. A lot of times, people are more interested in hearing a personal story than facts, data, and numbers. That doesn’t really affect people. AAPR: Tested will examine how communities of color, using stereotypes, are pitted against one another in a fight for dwindling public resources. What are some ways that we can combat this? What needs to change? CHIN: It’s a concerted effort by certain people in power to pit various communities of color against each other because it deflects attention from who’s really causing the problem. For instance, with the New York City public school system, instead of fighting over these few thousand seats at these eight high schools, why aren’t the communities working together to increase access to even more educational opportunities for every student in every neighborhood? Instead, these communities are forced to fight over a few thousand seats. That doesn’t make sense to me. AAPR: What are ways in which Asian Americans and Pacific Islanders (AAPI) can build coalitions to address education policy? CHIN: We need to have sensitivities toward each other’s issues. By that, I mean as it relates to communities of color or, in general, poorer communities. It’s a two-way street. Other communities need to be more sensitive to Asian American issues, but Asian Americans also need to learn more about other communities, too, particularly when it comes to poor African American and poor Latino communities. We also need to become more aware of the particular histories of those communities and the challenges that they face. Just as much we want them to know about our history and be more sympathetic and to support us, we should be willing to give just as much in return. 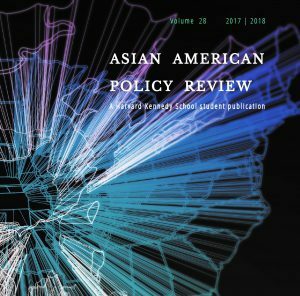 AAPR: You mentioned in your blog post “A Case of T.M.A.” that “[as education policy changes], it’s important to take into account all disadvantaged minorities, including poor immigrant Asian American families.” How can we make sure that poor immigration Asian American families are included in the debate? CHIN: Part of that is breaking down the stereotype that (a) all Asian Americans are naturally good at math and science and (b) that we don’t have any particular needs. Once you break down these stereotypes, you’ll understand that while we do have some measure of success as a community, it’s because we’ve faced discrimination, and education has been one of the outlets we’ve been able to utilize to overcome the racism we’ve encountered. There are also parts of our community that don’t have some of these advantages that other parts of our community have [and] that need additional resources. When you disaggregate the educational achievements within our community, there are some segments of the Asian American community that actually perform at even lower rates than African American and Latino communities. AAPR: What are concrete ways the Asian American community can break down stereotypes? CHIN: In terms of stereotypes of Asian Americans, I think these issues are becoming better. In general, America is heading in the right direction, but there’s still a long way to go. When it comes to combating stereotypes, the greatest weapon we have is exposure and being able to share our stories. One of the greatest things about new technology is that it has provided our community with that opportunity. As Hollywood continues to ignore and misrepresent our community, we can use new technology to tell our own authentic stories and to attach a face to the community. AAPR: What do you think are the most pressing issues facing Asian Americans and Pacific Islanders in this country? CHIN: As a community, we are still searching for a unified agenda that brings all the different elements of our community together. It’s been hard because our community is so diverse and each ethnic community oftentimes seems to have its own priorities. But there are a couple of issues that unite our communities more so than others and those issues are access to education and comprehensive immigration reform. Those are the two areas we have a lot of room to make progress on. AAPR: The AAPI community is one of the fastest-growing segments in this country. What can we do as a community to influence and mobilize around the political process? What role can media play in this process? CHIN: Media plays a big role in terms of mobilizing—not just getting out information, but also getting people involved. Asian Americans, as the most wired community, should use new technology to advance us forward. This is true for all communities of color. Studies have shown that we are the most connected: we watch movies more regularly than White communities, we watch more television, we’re on our smartphones more than other White communities, and because of that, that’s how we communicate. We should use these tools to our advantage. AAPR: How would you like to change the perception of Asian Americans in media? CHIN: In the end, I have my own personal biases about how I want the Asian American community to be presented. As a progressive, I would like that image to be a forward-thinking community. At the end of the day, for filmmakers and other artists, it’s really about equal opportunity to have their voices heard, too. So there could be a hundred or a thousand different interpretations of that Asian American story. I would never want to dictate how each of those artists should tell their story or what story they want to tell. I can only have my own sense of my vision for the community. If I can help increase more opportunities for various filmmakers and artists to get their word out, then I feel like I’ve done my job. That’s partly why I helped found this organization, the Asian Americans Writers’ Workshop. It’s an organization founded to help many writers get their voices out there. I don’t want a situation where you only have a few spokespeople speaking out for the community. I want as many people to have their voices out there as possible. AAPR: What are future issues that you would like to explore in your work? CHIN: At some point, I’d like to do something on gay and lesbian Asian Americans. Right now, in addition to this film Tested, I’ve been spending a lot of time working on a memoir called Everything I Learned, I Learned in A Chinese Restaurant. I hope it’s a book that works on many different levels. On the one hand, it’s a personal memoir about the time when I lost my father and had to move back to Michigan to sell the family business and the family home. On the other hand, it’s also a story about the city of Detroit and the loss of a great American city. The book will also cover a lot of Asian American history, but told through the personal journey of a single family. I hope the book will provide a different perspective of the Asian American experience. It’s a unique story. It’s about a gay Asian kid growing up in Detroit, the worst neighborhood, with prostitutes and heroin dealers. It’s a different take. Hopefully that will help expand the definition of what it means to be Asian American. AAPR: Do you have any advice for young Asian Americans? CHIN: Follow your passion. Never think that the story you want to tell or the issue you want to work on is too small. For instance, with the Vincent Chin movie, the fact that I traveled to so many colleges and so many different countries tells me that if there’s a story that you feel passionate about and you want to get it out there, just work on it. Do it. You’ll find that audience or that audience will find you. Don’t second-guess yourself in terms of the passions that you have in life. Just follow your heart. AAPR: Is there anything else that you would like to add? CHIN: Culture is very important in terms of impacting policy because politics is oftentimes something that happens in the head. It’s something you think about. It’s something you strategize over. But culture is something that happens in the heart. It’s something you feel. Part of the challenge in the Asian American community is making people feel like they’re Asian American, making them feel like they’re part of the community. You can’t politically mobilize people unless they feel like they’re part of something. That’s where culture and filmmakers and artists play a vital role. We are the ones out there making people feel Asian American, making them feel proud to be Asian American, making them feel that our community is something worth fighting for. It’s important for us to support the artistic and cultural endeavors in our community, because that’s going to lead to political empowerment and social justice for the community. This is what I’m about. Curtis Chin is an award-winning writer and producer who has written for ABC, NBC, Fox, the Disney Channel, and more. A member of the Writers Guild of America, he has also won awards from the National Endowment for the Arts, the New York Foundation for the Arts, the San Diego Asian American Film Festival, and others. He has also served on panels for the New York State Arts Council, the New Jersey State Council for the Arts, and the Liberty Hill Foundation. As a community activist, he cofounded the Asian American Writers Workshop and Asian Pacific Americans for Progress. In 2008, he served on U.S. President Barack Obama’s Asian American Leadership Council, where he participated in helping the campaign reach out to the Asian American and Pacific Islanders community. He has appeared on MSNBC, CNN, NPR, Newsweek, and other media outlets. He has personally toured more than 200 colleges, libraries, and corporations for his film Vincent Who? This interview took place on 22 February 2014. Chin, Curtis, and Adam Wolman. “A Case of T.M.A. ?” Huffington Post The Blog, 22 October 2013.